With the weather springing into life, I need to force myself to focus. Since I'm a procrastinator, I will do little things on little projects to avoid doing the big things on the big projects. That means I have to pick one (or two, I have a loose definition of focus) picture book(s) to coddle with attentive editing and love. Unfortunately, this feels akin to picking a favorite child, which is generally frowned upon. As for the ones which don't get picked, I won't make them sleep under the stairs or feed them bread crusts (like my real children.) It just means they will have to be a little more patient and wait until mama's ready to give them proper attention. What factors determine a picture book's chance of success? There's clearly an emotional element to the selection; each one is special in its own way (even the one who bangs his head on the seesaw when I'm busy.) The best way I know to strip out the emotion is with a spreadsheet! Sometimes my nerdy analytical side surprises even me. 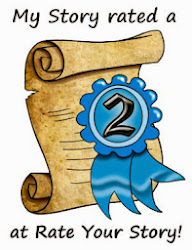 So I created a rating system, and I will now force each manuscript to run the gauntlet so I can rate them like the wicked stepmother I am! Ah Ha Ha! Halve the food rations! None of you deserve so much crust! Sorry, my brain must still be a bit warped from Spring Break, which btw is only a break for the teachers as best as I can tell. I need your help weighing in on the right factors and the rating. Am I missing something? Which one is the most important? Should all the factors be given the same importance? Could I narrow it down to a few key ones which really make a difference? With your help I just may be able to focus! 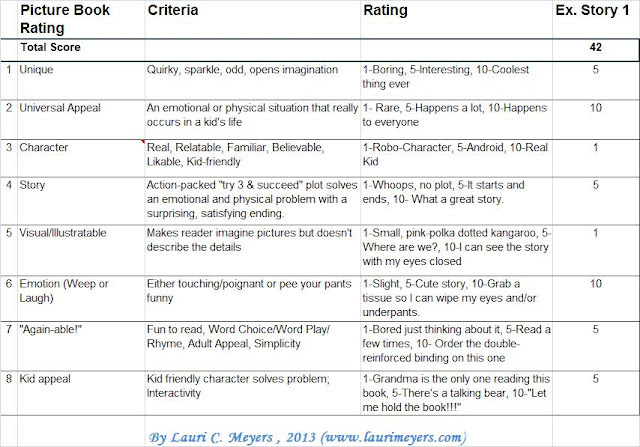 What a great tool for assessing our picture books in-progress! I must say, you are a very productive procrastinator. That's fantastic, Lauri. I'm going to print it off. I have a folktale type pb, maybe you could add something about the past. Also what about a line for non-fiction pbs about them being interesting, learning something, pictures helping so they are not boring. Great stuff! Good point, Catherine! I'm wondering if non-fiction should have its own rating system? Something about tie-in to common core, presenting facts in an interesting way, great photographs. I find call out boxes always draw attention. I also like several bold subtitles per spread with small paragraphs under each rather then lengthy text, which I imagine is overwhelming for young readers. I love how you've broken this down, Lauri - very helpful! (And also very funny :)) Thanks for sharing! Can something that isn't funny even really be helpful?! This is wonderful. Have you considered jumping on board with the folks at Rate Your Story? You'd be a tremendous asset over there. Thanks for sharing this. It must have taken a lot of time and effort. Miranda - What a lovely offer! Maybe after I prove I can score a "1" ;) Though I think it's easier to critique a story than to put those first words on that very white, very blank piece of paper. 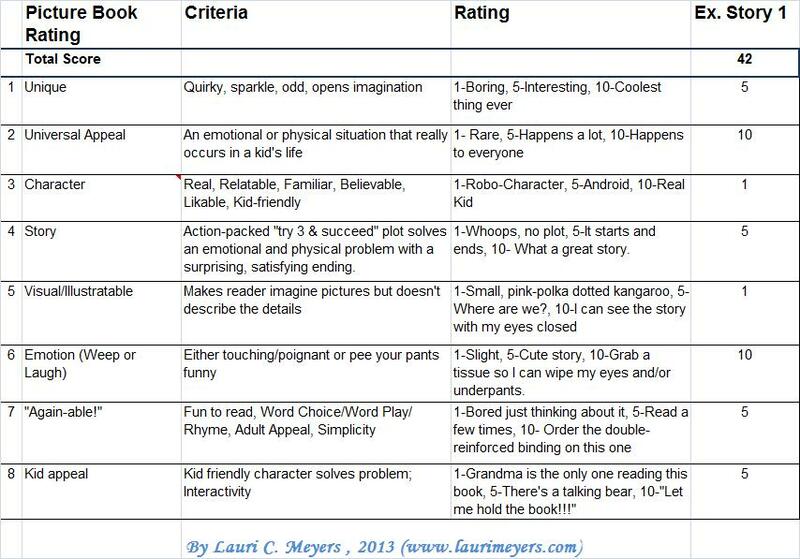 This is a great list.We did something similar when trying to judge Fiction Picture Books for the Cybils this year. I will be bookmarking this post to run through my MS. Actually I think it might work better if I have my critique partners run through this list and grade my story. Is it okay if I share/print out your scale? Darshana - Ooh, seeing the Cybils criteria would be illuminating. Of course you can print/share - I see your email on your site, so I'll just email you the excel version which will be easier to work with. Great list, Lori! It must have taken a good deal of effort to put that together, it's wonderful. Oh, so true! You poor dear, put your feet up and take a break! At least you get a break from your kids while your teaching and a break from the other people's kids when you're on spring break. We need to invite a day called "Mommy Day Off." Mothers Day doesn't count because that might as well be let's "Cling to Mother All Day Day"
Mothers Day doesn't count because that might as well be let's "Cling to Mother All Day Day"
Love it! You put a lot of effort into this. It is easy to use. I find the simple 1-5 scale so difficult (referring to Goodreads stars). Your scale assesses every important element and takes it into consideration so the rating will be more conistent for the individul rater. Permission to use?! Love the rating comments! Since I am don't purchase many, one of my own criteria questions is would I buy it - and who for. Julie- That is such a simple question that really packs a punch! I often flippantly call a manuscript "picture book for ages 4-8," but I could learn a lot about the story by thinking of it in more specific terms: "This book is perfect for a 4-year-old girl with an active imagination." Nice and Funny, Mrs. Meyers! I LOVE it! Nice and Funny are attributes always worth striving for Erik! Oh! I like what your warped brain produces! This is awesome! What if my brain is really warped? Maybe I have an unusual worm hole in my brain which allows the creative and analytical parts of my brain to party together? I hope the universe doesn't implode... And what if it's contagious?! This is a great way to make sure your bases are covered once you've completed a PB draft. But I think you chart is incomplete. Don't you need to add a "fart joke" catgory? I could rename it "Fart Book Analysis," and it would still work for all of my stories, this is true. But most books don't hit 10s on all of these areas, right? A perfect score isn't an 80. It is probably more about having at least three areas of 10, I think. Hmm, I need to run some current books through the scale. Maybe length and words per page? As a writer I hate to think that's important, but as a mother of a 2 1/2 year old, it's a different story. There are certain books that he will consistently sit through every time, and most have have word counts per-page that are consistent and not overwhelming. Giraffe and a Half is a perfect example. While I love that book, he always gets bored by the middle (when the word county gets very long per page). Good point about words per spread. Picture Book writers talk a lot about word count, with 300-500 words being guidance. Back in the day, PB writers could have 1000-2000 words. 500 words means about 40 per spread. I'm having an A-ha moment! Great picture books are made up of 14 great images, and the writer has 40 words to bring each image to life.